The Summer Palace is one of Beijing's most beautiful outdoor attractions. Beijing is hectic. Cars, people, motorcycles, and bicycles whiz by whether you are in the street or on the sidewalk. Bodies push and shove in and out of metro cars and cut in line if there is an extra inch of space. Everybody is in a hurry until they aren’t. The best way to get away from this frantic pace is to explore Beijing’s top outdoor attractions, which are introductions to ancient China and can be enjoyed at a slower pace. 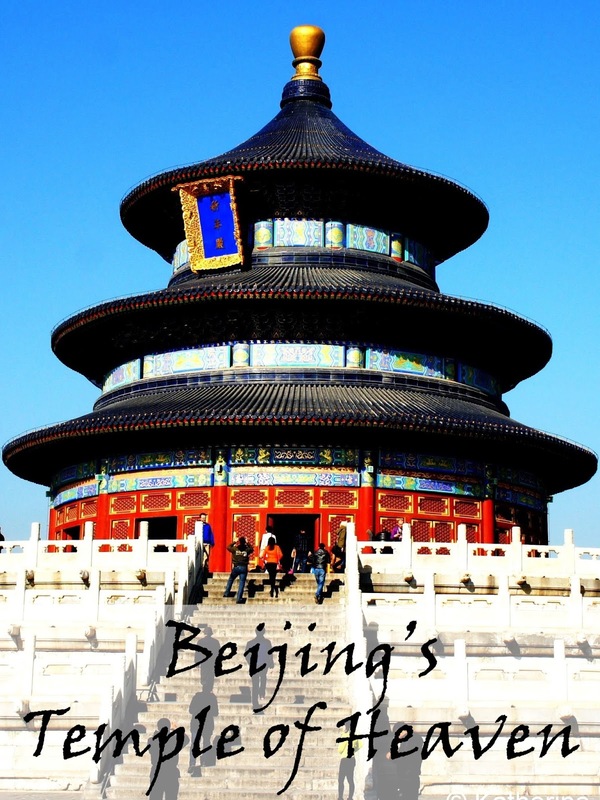 My favorite sites and activities in Beijing included touring the Temple of Heaven, Lama Temple, and the Summer Palace, as well as exploring Beijing’s hutongs and visiting the Drum and Bell Towers. The Temple of Heaven is a welcome respite from the fast-moving city outside the park’s walls. Built in 1420, the 273 hectares park was used by the emperors of the Ming and Qing dynasties to worship heaven, offer sacrifices, and pray for China’s harvests. A prevailing theme is the use of round (heaven) and square (earth) shapes throughout the park. The complexes include the Hall of Prayer for Good Harvests, the Circular Mound Alter, the Imperial Vault of Heaven, and the Abstinence Palace. Now the Temple of Heaven is not used for worship, but is an expansive park where the locals go to socialize and exercise. You can see everything including tai chi, line dancing, hacky sack, water calligraphy, and opera singing. 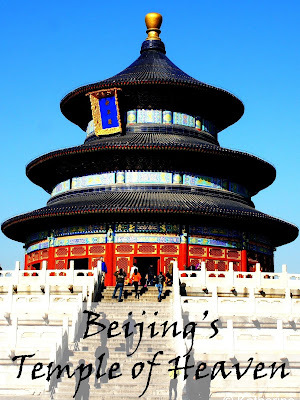 Beijing's Temple of Heaven Park. The sights and sounds of Beijing's Temple of Heaven Park. The Temple of Heaven Park can be reached from Tiantandongmen Metro Station exits A or B.
Yonghegong Tibetan Buddhist Lama Temple is a beautiful temple in Beijing. Lama Temple was originally built as a palace in 1604 by Prince Yong in the Qing Dynasty. When he became emperor, the residence was turned into a temple. The complex is built in a similar style to the Forbidden City, with large halls situated on the central axis, but unlike most of the buildings in the Forbidden City, the buildings of Lama Temple can be entered. Also unlike the Forbidden City, Lama Temple and its treasures were able to survive through the turbulent years of the Cultural Revolution and the temple reopened to the public in 1981. Many Buddha statues, including some very large ones, are enshrined in the various halls. Unfortunately pictures cannot be taken inside the halls, but they contain some fascinating exhibits in addition to the large Buddhas. One of the buildings contains the statue of Maitreya, a 26 meter high Buddha which is certified by the Guinness Book of Records for being carved out of a single white sandalwood tree. Worshipers at the Buddhist Lama Temple. Lama Temple can be reached from Yonghegong Lama Temple Metro Station exit C.
The Summer Palace is a sprawling royal complex in northwest Beijing. The Summer Palace was built in 1750 and completed in 1764 and was the Imperial palace in the Qing Dynasty. The garden, at 290 hectares, is one of the largest Imperial gardens in the world. To fully explore the palace, set aside a few hours. Upon entering the Summer Palace you will first encounter Suzhou Street, a re-creation of a Chinese commercial area along a pretty canal. Atop Longevity Hill are a number of buildings including a group of temples called the Four Great Regions, the Sea of Wisdom Temple, and the Tower of Buddhist Incense. The path descends down the hill to the enormous Kunming Lake, deepened and expanded in the 18th century by 100,000 laborers. There are paths around the lake, which can also be crossed by ferry. Exploring the Summer Palace makes for a beautiful and relaxing afternoon. Sea of Wisdom Temple on Beijing's Summer Palace's Longevity Hill. 17 Arch Bridge at Beijing's Summer Palace. The Summer Palace can be reached from Beignongmen Metro Station. Hutongs are Beijing’s ancient networks of small streets and alleys. This is where Beijing’s hurried pace slows down in charming narrow lanes. We explored the hutongs around the Drum and Bell Towers, which we coincidentally returned to the same evening for our home-cooked meal and dumpling lessons at the end of our Beijing food tour. We later learned that while the hutongs are the ancient streets of the city with very old residences and long-time inhabitants, these areas are becoming expensive real estate as Beijing citizens begin to recognize their appeal. One of Beijing's hutongs near the Drum and Bell Towers. The Drum and Bell Towers are located north of the Forbidden City along the north-south axis that runs through Tiananmen Square and the Forbidden City. Both towers can be climbed and provide panoramic views of Beijing as well as views of the tower opposite. Our guidebook suggested climbing the Bell Tower for better views, as the Drum Tower is the more attractive tower. However, if you are only going to climb one, I would suggest climbing the Drum Tower as this will allow uninterrupted views towards the Forbidden City. The Bell Tower contains a bell 5.55 meters high, 3.4 meters wide, and weighing in at 63 tons. 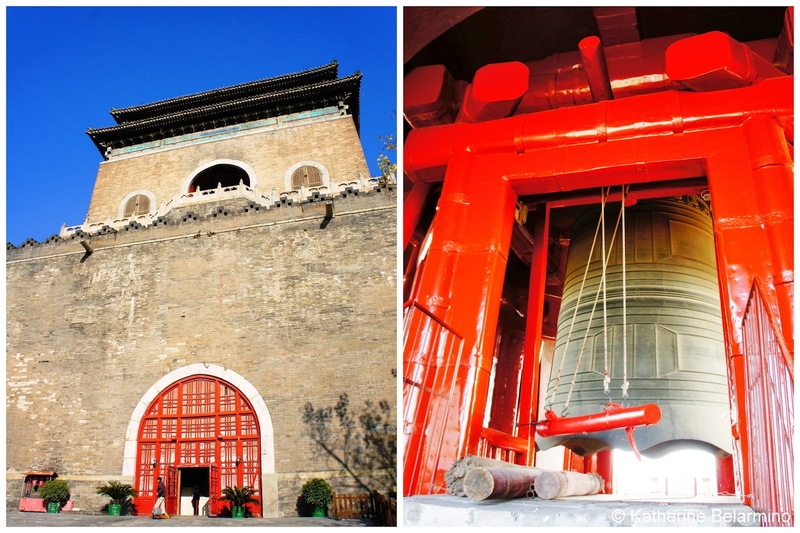 It is called the King of Ancient Bells and was cast during the reign of Emperor Yongle of the Ming Dynasty. In ancient China the nighttime was divided into five Gengs, each two hours in length, starting at 19:00 and ending at 5:00. The first and fifth Gengs were announced by the drum being beaten first followed by the striking of the bell. The second, third and fourth Gengs were announced by the bell being struck. The Drum and Bell Towers are most easily reached from Guloudajie Metro Station exit G.
Beijing can be overwhelming, so it is a relief to incorporate time at these slower-paced attractions into the travel itinerary. The Lama Temple, Summer Palace, and Drum and Bell Towers provide beautiful views into ancient China, and exploring the hutongs and wandering through the Temple of Heaven provide insight into the calmer side of Beijing life.